Wine! Back roads! Food truck with tasty morsels! Epic vistas! 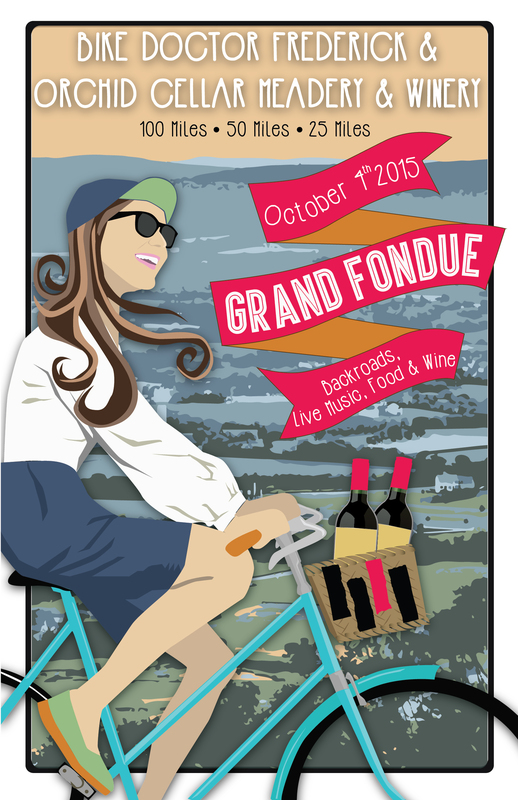 The 2015 Grand Fondue at Orchid Cellar Meadery and Winery is coming and this year we have great things planned. As usual, we’ll have a really cheap entry fee. A no-profit venture with all proceeds going to a help support a local rider who is battling cancer. Our Grand Fondue is about eating and riding. Ride a huge ride, come back to a scenic winery in Middletown for some awesome food and wash it all back with some Merlot or Mead at Orchid Cellar. Nothing will be timed; there will be no winners. It’s going to be a challenging but relaxed ride, an easy pace to ease the legs through the terrain. We’ll take in some of the finest and smallest roads in Frederick County. Charity – All proceeds will be going to help out a local cyclist, Angela Rand Lakatos, who is battling Cancer. Angela is a longtime local mountain biker, who has helped many of her close friends in need. She has done pro bono legal work for local race promoters, and trail work in the watershed (perhaps you have ridden Angie’s trail?). In March 2015 Angela found a lump. The biopsy came back positive for 2 types of stage 3 cancer, and she has been told it is aggressive. Chemotherapy began on April 10, 2015 with multiple surgeries to come once recovery begins. To follow Angie’s story, visit Angie’s fight on Facebook. In a short amount of time the family is witnessing the cost add up, and Angela only has so many days of leave available to her and that will be used up fast. So we want to do something to help! 100-Mile Route. 9,000 feet of climbing! Please know your limits, this will be hard but doable. In the past, this has taken some riders close to 10 hours to finish. Ride starts from Orchid Cellar at 7 am, so get there early to sign a waver and get situated. Lights are a good idea in case a flat or wrong turn keeps you out a little later. This will be a tough ride with a lot of climbing and some gravel roads mixed in. 25mm or 28mm tires are recommended. Extra tubes are a really good idea too! I would leave the carbon wheels at home. 50-Mile Route. 8:30 a.m. Start time. A little tamer but still challenging and takes you to some of our favorite local roads. Around 3,700 total feet of climbing and a little gravel too! Again, larger tires and extra tubes recommended. 25-Mile Route – The shorter ride will leave from the Orchid Cellar at 2pm. About 2k of climbing and of course some gravel! Who: Bike Doctor Frederick and Orchid Cellar are hosting this event. Because this is a winery, you need to bring an ID with you if you want to partake. This isn’t a 21+ event, and we have to card because of that. Outside booze is prohibited and illegal. For non-riders: free entry and wine tastings for a minimal charge, are available with Orchid Cellar staff on site. What does my 30 bucks get me? Two glasses of either Merlot or Mead, a commemorative glass with something about the Fondue on it, and a super minimal sag wagon with some minimal support stations. There will be local music out there, as well. Food trucks will be dishing out some awesome food, so bring some cash and come hungry!!! There will be a few sag wagons, but KNOW YOUR LIMITS. If 10,000 feet of climbing sounds like a lot, it is. This ride makes the Civil War century seem civil… The riding will be hard, even if the pace is not. There will be gravel and dirt roads. Challenges galore. Please sign up for the appropriate ride for your abilities. Remember, even the short ride will be rad! We’ll have a mechanic who is roving around, but he will be minimally equipped. The 50 miler and the 100 are both hard this year. Rough, too. Come prepared. What to bring: A bike with low enough gears to get you through a big HILLY ride, water, lots of food, and appropriate clothing. We’ll be huffing up huge hills and coming down them pretty fast. It can get a little cold descending after a tough climb. We won’t have spare clothing, so figure out what works and bring it. There will be very few places to stop for additional food. There will be only a few designated rest stops, and they will have minimal provisions: extra water, Gatorade, basic snacks. This is not a supported century ride. This is a big self-supported ride in the country. Please bring a blinkie light and use it, especially if it is overcast, starts to rain, or you just get caught out in the dark, we want you to be safe. Spare tubes (2 per person), a patch kit and a enough C02 or a hand pump to fix at least 2 flats. We will be on some dirt roads, so please bring a bike you will be comfortable riding on such surfaces. If it is a road bike, get some durable 25mm tires or 28′s if they fit. Ask in the shop if you are unclear on any of this. ← 2014 Grand Fondue. October 12th!